At the Region is an ongoing feature that discusses the state-by-state training, certification and employment requirements of first responder departments across the nation. 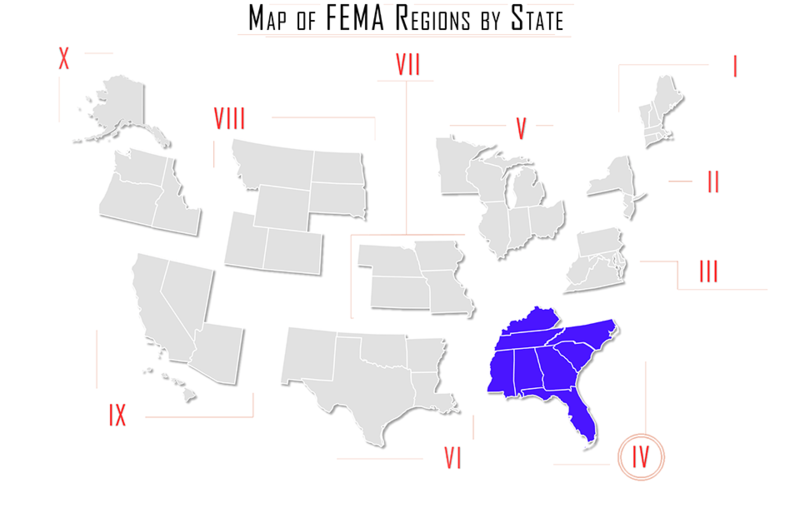 In this issue, At the Region looks at requirements in Part One of FEMA Region IV: Alabama, Florida, Georgia, and Kentucky. To complete the licensing requirements, applicants must provide proof of NREMT registration. NREMT requires an approval process, including the submission of training records and the completion of a state psychomotor exam, prior to approval for its written and practical examinations. Instructions on creating an account and requesting approval for testing may be found here, and requirements for NREMT certification are here. Alabama licenses may be valid for one year or two years, depending on the form of license requested in the initial application; all licenses are valid until March 31st of the year they are listed to expire. EMTs may renew their license using the application form, or through the online system (a login area and forms will appear on the site during the renewal period of January 1st to March 31st). Application guidelines for renewal are available here. Applicants with an NREMT Intermediate certification are eligible to be licensed as EMTs in Alabama. All out-of-state providers must undergo Alabama protocol verification, including physical skills and scenario competency testing. This requires evaluation by a Medical Director or Training officer in select areas listed by certification type here. A list of scenarios and maximum time provided for each is available here, and the manual of Alabama EMS Patient Care Protocols is also online. Along with proof of education, applicants must submit a $35 fee and either a Red Cross CPR Professional Rescuer card, an American Heart Association BLS for the Healthcare Provider, or an equivalent certification that meets requirements provided here. EMTs must apply to NREMT and pass all examination requirements to complete the certification process. Exam results may be accessed online here, and applicants who pass will be issued their certification within 30 days of the State’s receipt of a passing result. EMTs may apply for initial certification by creating an account on the MQA Services website, and full instructions on using this system are available here. Following the first two-year certification period, EMTs must complete continuing education requirements to renew their state certification. This includes a total of 30 hours, with at least two hours in pediatric emergencies. A list of approved CE providers is available here. Florida offers reciprocity to EMTs licensed or certified in other states, and EMTs holding current NREMT registration. Applicants must submit a copy of their certification/license along with all other documentation required for initial Florida certification, and pass the NREMT written basic assessment exam; only exam results obtained after applicant has been granted eligibility in Florida will be accepted. Once these requirements have been met, applicants must register for and pass all NREMT examinations, including the written and practical assessments. The EMT level required for practice may vary by location, with some agencies requiring a minimum of EMT-I certification to staff an ambulance; check with the department of interest to verify their requirements. Licenses are valid for two years, and may be renewed online here. EMTs should have their SSN, driver’s license, and a method of payment accessible to complete the forms. The license will be available to print at the end of the renewal process. Georgia offers reciprocity to NREMT-certified EMTs at the Basic, Intermediate, Advanced, and Paramedic levels. Interested EMTs should submit an application, along with the initial certification fee of $75 in the form of a money order, business check, or cashier’s check. Applications are processed within five to seven days. In order to maintain certification, EMTs must renew through the KEMSIS, and meet all continuing educational requirements. Applicants may meet state guidelines by providing proof of 24 structured contact hours in a range of areas, or by maintaining current NREMT registration. Applicants must also provide a current CPR card, proof of HIV/AIDS educational certificate, and $25 renewal fee. Reciprocity is offered to EMTs who are both certified in another state and NREMT-registered. Applicants must submit proof of both forms of certification, along with a fee of $165, and all documentation as defined above for EMT applicants, aside from testing and skills results.